Benjamin Fulford was Asia-Pacific Bureau Chief for Forbes Magazine for seven years, until 2005 when he quit because of the "extensive corporate censorship and mingling of advertising and editorial at the magazine." He currently lives in Tokyo Japan where his books are waking up the Japanese people to 9/11 Truth. 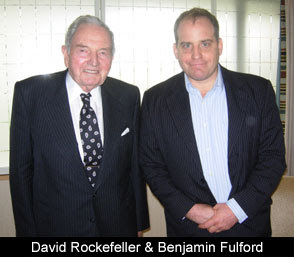 On November 13, 2007 Fulford received a tip that David Rockefeller was on his turf, and without hesitation Fulford arranged to meet with him to ask some questions. It is not odd for a reporter who's career has been filled with Financial News jobs, to sit down with the former head of Chase Bank, Except when its Benjamin Fulford and David Rockefeller. Earlier this year Benjamin Fulford interviewed Heizo Takenaka, a former finance minister in Japan and confronted him about "having sold the Japanese financial system over to the Rockefellers and Rothschilds." According to Fulford this interview made a lot of people angry. He says a professional assassin showed up and told him to accept a job of great importance or be killed. The following day Fulford claims to have been contacted by a powerful Asian Secret Society with more than 6 million members that have targeted the Illuminati. They asked Fulford to represent them, negotiate for them, and offered him protection in return. He came out with his story on the Jeff Rense radio show this summer. Fulford said that he could link Rockefeller to crimes in Japan as a "part of his effort to take over the Japanese financial system." This story was picked up by the Colbert Report. "Some even believe we (the Rockefeller family) are part of a secret cabal working against the best interests of the United States, characterizing my family and me as 'internationalists' and of conspiring with others around the world to build a more integrated global political and economic structure---one world, if you will. If that's the charge, I stand guilty, and I am proud of it." At the mere mention of Ron Paul, Rockefeller grinds his teeth, and acts as if he doesn't know anything about him, but when Fulford says that Ron Paul wants the powers of the Federal Reserve returned to the United States government, Rockefeller's eyes widen in amazement and dread, "I would not look upon that as one of the great issues that needs to be addressed." Yet here we are, our dollar collapsing. He knows who Ron Paul is. It is established that David Rockefeller is in Japan to meet with the Emperor, he claims to have been summoned by him and he casually mentions that his family has been close with Japan and the Royal family for many years. Fulford breaks in the video throughout the interview with some commentary, and at this point he tells how he sees it, "a secret representative of the secret government of the United States meeting with the secret government of Japan." Fulford offers insight into his concerns for the people of Asia, and about the role of Asia in the world. He poses a question to Rockefeller about the choices of the UN, why Asian countries are not properly represented there, and to that Rockefeller says that "someday," they will be. Fulford makes it clear in the edit, that the Asian people are tired of waiting, and an answer like some day is as good as forever to them. But Fulford continued asking tricky questions. Rockefeller almost had a stroke trying to decide whether the War on Terror or Global Warming were more important, you could see the pain it would cause him to have to choose, ultimately he could not, they are both too important. To prove a point as to why his questions were not so aggressive towards Rockefeller, Fulford asks about what he thought of people that believe that he is "the secret ruler of the world," and oddly enough Rockefeller thinks they are "crack pots." "You will be free soon. Thank You." Breaking News Ed and Elaine Brown are Surrounded!